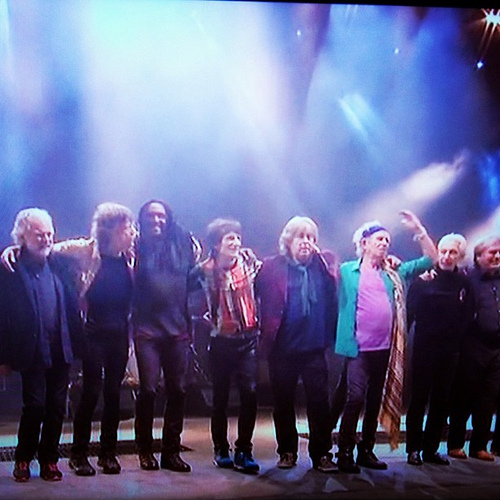 I watched the Stones on TV last night (performing at the Glastonbury Festival). I love the Stones. They were one of the first bands I adopted as a teenager, and I still play my battered 40+ year old copies of Beggars Banquet and Let it Bleed. But I wish they’d given up years ago. When they ran out of ideas. Now they are just a good tribute band. A caricature of their former selves. Mick Jagger’s energetic antics, and the lashings of hype, cannot disguise the fact that what was once a band is now a brand – the spirit is weak, even if the flesh is willing. Could not disagree with you more on this one Jim. First album I ever bought was High Tide and Green Grass and like you I love them, even their newer stuff appeals to me including Doom and Gloomlasy year. Have seen them a few times now live and like most concerts watching it live and loud has a completely different buzz and energy than watching on TV. I have yet to hear a rock band that musically is so tight and together when playing and I will always prefer to see the originals over a tribute band. They have their critics for sure have their longevity, their crinkly looks and high ticket prices but millions would still give anything to see them play. Why deny the masses! I listened to the Doors Morrison Hotel a few days ago, and was amazed how good it was. Back then (1969?) albums like this were coming out every few weeks (or so it seemed). Now it's just a production line, but all today's bands seem to be coming out with the musical equivalent of a Mcflurry. Roadhouse Blues from Morrison Hotel is such a brilliant driving track. The album was released in 1970, though recorded in 1969, and sounds as fresh and current now as it was then. We are the few left who probably still have a turntable to play vinyl on :-) Next time you are down this way Jim we must have a vinyl session. Have got stacks of it!